David Backes and Troy Brouwer each scored on the power play, Alexander Steen had two assists in his first game since Feb. 20, and Vladimir Tarasenko scored his Blues-leading 36th goal to help St. Louis keep pace with the Dallas Stars in the race for first place in the Central Division. 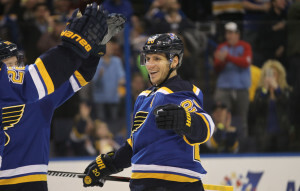 The Blues and Stars, who defeated the Nashville Predators 5-2, each have 101 points. The Blues (46-22-9) have won five games in a row and 11 of 13. When goalie Brian Elliott allowed a first-period goal it snapped the Blues shutout streak at 258:29, longest in franchise history. Elliott made 20 saves, but his shutout streak ended at 193:12. He is 10-0-1 in his past 12 starts and 4-0-0 with a 0.25 goals-against average and .989 save percentage since coming off injured reserve.